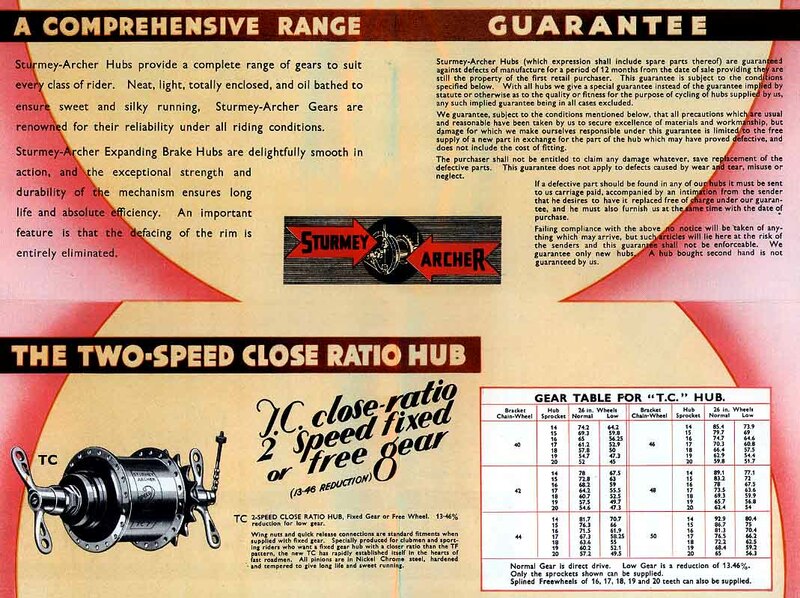 This page describes Sturmey-Archer hubs from the 1930s onward, and gives links to information about them on this site and others. Sturmey-Archer Heritage Web site -- information on hubs from 1902 through 2000. Rows with white backgrounds in the table below are for "ghost" hubs -- no longer sold, not in the 2015 catalog -- though some of these are very common, or mostly the same as current hubs. Rows with yellow backgrounds are for hubs which are in both the 2010 catalog and the 2015 catalog. Rows with green backgrounds are for hubs in the 2015 catalog only. Hyperlinks from the model numbers in the left column will take you to servicing information on individual hubs. For old hubs where there is no hyperlink, look on Tony Hadland's site, the Sturmey-Archer Heritage site or the Veteran-Cycle Club library site (Links at top and bottom of this page). Harris Cyclery, SJS Cycles and Oldbiketrader in the UK maintain stocks of discontinued Sturmey-Archer hubs and parts. 2-speed kickback hub, coaster brake, steel shell. Also see coaster-brake page. 2-speed kickback hub, no brake, aluminum shell. Note, same model number as new S2 but different ratios. 1960s model with kickback shifting. 2-speed kickback hub, coaster brake, aluminum shell. Also see coaster-brake page. A rare 1930s model, made for club bicycles and tandems. sales brochures for this model. 2-speeds kickback, coaster brake, aluminum shell, reverse gear and second sprocket, made for a tricycle. This is a gearbox, not a hub and must be used in an intermediate position on the frame, with input and output chains, because the secondary sprocket attaches where the spokes would. A rare 1930s model, made for club bicycles. Basically an AW, with cable-operated drum brake. With cable-operated 90 mm drum brake. Still sold in 2010. A rare model, made for club bicycles, time trials. Basically, an AW with a built-in Dynohub generator. A rare model, made for club bicycles. A very rare 1930's model, made for club/racing bicycles. Fixed gear. Extremely rare, and lots of fun! This site has two separate pages devoted to this hub: See the main ASC Page for general info, and the ASC Tech Page for service instructions, cutaway and exploded diagrams. "Elite" 70 mm drum brake and no-intermediate-gear (no neutral) internals. "Elite" indicates a hub with an aluminium shell. This is far and away the most common model, introduced in 1936. No-neutral-gear version still sold in 2010 --75th anniversary is coming up in 2011! Also see rebuilding instructions in Sutherland's Handbook of Coaster Brake and Internally Geared Hubs. Three speed coaster brake. No-neutral-gear version. Steel shell. Also see rebuilding instructions in Sutherland's Handbook of Coaster Brake and Internally Geared Hubs. Slight modification to the AWC. Also see rebuilding instructions in Sutherland's Handbook of Coaster Brake and Internally Geared Hubs. Special Brompton extra wide-ratio 3-speed used with 2 sprockets and a rear derailer to make a 6-speed hybrid-gearing system. Hybrid gearing, fits a Shimano or SRAM 8- or 9-speed cassette. Disk brake fitting. Available in several colors. Coaster brake, aluminum shell, reverse gear and second sprocket, made for a tricycle. This is a gearbox, not a hub and must be used in an intermediate position on the frame, with input and output chains, because the secondary sprocket attaches where the spokes would. New version similar to the AW, with an aluminum shell. Rotary shifting interface inside the dropout; band brake fitting, could be used for a drive sprocket. New version similar to the AW, with an aluminum shell. Rotary shifting interface inside the dropout; no brake. "Steelite" with 70 mm drum brake. "Steelite" indicates a hub with a steel shell. Coaster brake. After Consumer Reports rated the TCW IV "unacceptable" because the brake would fail completely if the shift cable was misadjusted, Sturmey-Archer completely redesigned the Tricoaster, so that the braking was independent of the gear-change. This model is safer than the TCW series, but is still prone to failure. Also see rebuilding instructions in Sutherland's Handbook of Coaster Brake and Internally Geared Hubs. SunRace/Sturmey-Archer's new-production 3-speed fixed gear, supplanting the rare ASC. A matching front hub, the HBT, is available. Aluminum-shell version of the AWC(II), with coaster brake. New version similar to the AW, with an aluminum shell. Improved pullchain interface; no brake. New version similar to the AW, with an aluminum shell. Improved pullchain interface; disc brake fitting. This model was intended to replace the AW in 1957, but was so troublesome that it was withdrawn, and the AW re-introduced in 1958. The SW uses a unique 3-prong driver, and has crescent-shaped pawls that don't use pawl springs. When they work, they're very nice. They are light, nearly silent, and efficient. None of the internal parts are interchangeable with other models. See Brian Hayes's article on this site. Wide-body 3-speed (for wide dropout spacing) with threads on left side for band brake drum or sprocket. Wide-body 3-speed (for wide dropout spacing) with fitting for brake disk. Coaster brake. Mark I, II, III, IV. Brake would fail if cable adjustment was incorrect, replaced by the S3C. Also see rebuilding instructions in Sutherland's Handbook of Coaster Brake and Internally Geared Hubs. Threading at left side for band brake -- could be used for a drive sprocket. High-polish aluminum shell, reverse gear and second sprocket: made for a tricycle. This is a gearbox, not a hub and must be used in an intermediate position on the frame, with input and output chains, because the secondary sprocket attaches where the spokes would. Coaster brake, high-polish aluminum shell, reverse gear and second sprocket: made for a tricycle. This is a gearbox, not a hub and must be used in an intermediate position on the frame, with input and output chains, because the secondary sprocket attaches where the spokes would. No brake, high-polish aluminum shell, reverse gear and second sprocket: made for a tricycle. This is a gearbox, not a hub and must be used in an intermediate position on the frame, with input and output chains, because the secondary sprocket attaches where the spokes would. 90 mm drum brake, aluminum shell. 70 mm drum brake, aluminum shell. Like the FG, but with cable-operated drum brake. See rebuilding instructions in Sutherland's Handbook of Coaster Brake and Internally Geared Hubs. A rare model, made for club bicycles. Same as the AF. Basically an FW with a built-in Dynohub generator. I have one of these on my 1954 Superbe Roadster. Also see rebuilding instructions in Sutherland's Handbook of Coaster Brake and Internally Geared Hubs. The most common four-speed model. Also see rebuilding instructions in Sutherland's Handbook of Coaster Brake and Internally Geared Hubs. An S5-2 with a beefy alloy shell; late UK production. Also see rebuilding instructions in Sutherland's Handbook of Coaster Brake and Internally Geared Hubs. Last dual-cable 5-speed hub -- a problem hub. "Elite" version with aluminum shell also was sold. Dual-cable, with drum brake -- a problem hub. The earliest 5-speed hub, a modified FW. The original S5 used two cables, a conventional 3-speed type on the right, and a bellcrank/pushrod unit on the left. The right lever/cable has 3 positions, and works as a normal 3-speed hub. The left lever/cable converts the hub from a medium ratio to a wide ratio 3-speed. Since the middle gear is direct drive, the left control has no effect on the middle gear. Most, if not all Sturmey-Archer 4-speeds can be converted to 5-speeds. The planet cage is the same but the axle and large sun gear must be replaced so they engage in both directions. See additional information. Also see rebuilding instructions in Sutherland's Handbook of Coaster Brake and Internally Geared Hubs. Replaced the S5; used two pullchains rather than having a bell crank on the left side. Unreliable, tended to pop out of low gear. Also see rebuilding instructions in Sutherland's Handbook of Coaster Brake and Internally Geared Hubs. Improved, reliable version of the S5/1. The S5-2 has a bit more internal friction than the plain S5. Axle assembly and axle gears are different. Also see rebuilding instructions in Sutherland's Handbook of Coaster Brake and Internally Geared Hubs. Ball locking mechanism, disk brake fitting, large flanges. May not have existed. This hub is listed online as having rotary shifting but probably is the same as the QS-RCF(W) below, with pullchain shifting. Ratios are the same as pullchain-shifting hubs, and installation instructions and specifications are for a hub with a pullchain. Coaster brake, reverse rear and second sprocket. This is a gearbox, not a hub, and must be used in an intermediate position on the frame, with two chains, because there is a bracket that goes across where the spokes would be. Wider ratio, introduced 2009, pullchain shifting, coaster brake, reverse rear and second sprocket. This is a gearbox, not a hub, and must be used in an intermediate position on the frame, with two chains, because there is a bracket that goes across where the spokes would be. This hub is listed online as having rotary shifting but ratios are the same as pullchain-shifting hubs, and installation instructions and specifications are for a hub with a pullchain. This is a gearbox, not a hub, and must be used in an intermediate position on the frame, with two chains, because there is a bracket that goes across where the spokes would be. This hub is listed online as having rotary shifting but ratios are the same as pullchain-shifting hubs, and installation instructions and specifications are for a hub with a pullchain. freewheeling, second sprocket but no reverse gear. This is a gearbox, not a hub, and must be used in an intermediate position on the frame, with two chains, because there is a bracket that goes across where the spokes would be. Wider ratio, introduced 2009, coaster brake, steel shell. Coaster brake, reverse gear and second sprocket. This is a gearbox, not a hub, and must be used in an intermediate position on the frame, with two chains, because there is a bracket that goes across where the spokes would be. 7-speed single cable, steel shell. 7-speed single cable with coaster brake. Different appearance, ball locking sun gears, otherwise like the Sprinter 7. Different appearance, ball locking sun gears, otherwise like the Sprinter 7 Coaster. Different appearance, ball locking sun gears, otherwise like the AT7. 2009 model, no brake, steel shell. 2009 model, internal drum brake. Fixed gear/freewheel track hub. Available in several colors. Coaster brake. See rebuilding instructions in Sutherland's Handbook of Coaster Brake and Internally Geared Hubs. Front track hub to match the S3X fixed-gear hub and HBT-30 fixed/free hub. Available in several colors. Formerly, drum brake for rod operation (similar to BFC) This name is also used for a 90mm cable-operated drum brake with a steel shell: (instructions and parts list for more recent model). sales brochures for the older model. Front hub with 70mm drum brake. 70 mm "Steelite" (steel shell) drum brake for cable operation. Also see info on Tony Hadland's site. Front single-side (tadpole tricycle front) hub with 70mm drum brake. Front single-side (tadpole tricycle front) hub with 90mm drum brake. Front hub with built-in Dynohub generator. Sturmey-Archer documents at the Veteran Cycle Club Library.